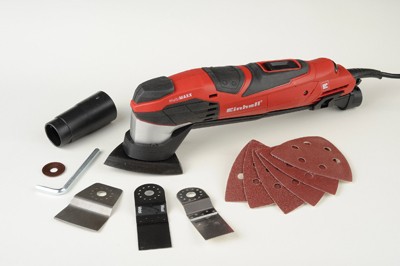 Einhell deserve credit for smart, stylish design and external construction that seems the equal of any other brand. 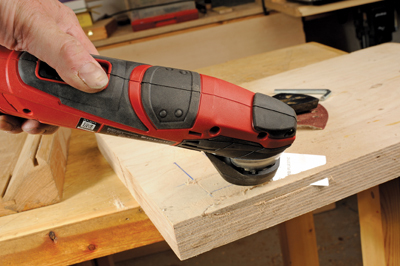 This model, the RT-MG 200 E multi-tool has a tough plastic slimline casing with good areas of rubber overmould, including several deliberate 'grip pips' on the top to make holding and positioning easier. Since this machine will vibrate in use, comfort for the user is important. There is an easy-to-use slide switch towards the rear and a speed thumbwheel at the very back. The brightly finished aluminium gearhead at the front holds the oscillating rotary shaft with the tool holder on the end. This has four small pips for locating the blades and delta sanding head so they can be positioned however you like to suit the angle of attack when working. The fitting is the same as the Bosch models and one of the Fein machines as well, so you have some choice of consumables available including third party manufacturers. A simple Allen bolt and washer secure the tooling in place. The motor has a creditable 200W of input power which matters for sawing action and there are motor brush covers should the brushes ever need changing. Lastly there is a long extraction pipe that clips on underneath and with a narrow bore outlet plus an adaptor to a more normal pipe size. This machine comes in a blowmould case with a limited selection of tooling which you will want to add to periodically in due course. As a delta sander it works extremely well and can get into corners without inflicting damage on surrounding raised edges and the extraction actually seems to work. With the standard plastic and wood saw blade fitted I could cut shallow slots or remove an arris quite easily. I would not recommend deep slotting unless a curved blade is installed, as a high level of uncontrolled vibration sets in. Used correctly, this multi-tool works remarkably well and while not as powerful as a trade rated model, it does very well within its designed capacity.